The place to learn about metal bar stools. Looking to create a sleek and modern look for your breakfast bar, utility room, craft room, or just about anywhere else? Consider going a bit retro with metal bar stools. Bar Stools and Chairs carries a number of customizable models, with backless stools, stools with backs, and frame options in black or chrome. Choose a custom color to perfectly match your decor, and heighten your industrial look with a metal bar stool that will last for years and years, and create a constant conversation piece for guests and friends. The Lucy Diner Chair is manufactured in Chicago, IL by chair and bar stool manufacturer Richardson Seating. 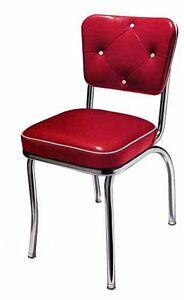 Richardson Seating manufactures the Lucy Diner Chair as well as many other styles of diner chairs. You can find the greatest selection of diner chairs at the website www.barstoolsandchairs.com. If you are looking for diner chairs in cracked ice vinyl, you can find more about cracked ice vinyl at www.crackedicevinyl.com. I also have a blog www.dinerchairs.com that you can check out. The blog is a great resource for diner chairs. The Lucy diner chair is probably the most popular diner chair of all time. It was sold at a very large retailer for over 3 years. There are tens of thousands of lucy chairs out there in circulation. Luckily you can still find the Lucy Diner chair online at many different retailers. The metal bar stools sold at BarStoolsandChairs.com are commercial restaurant bar stools built to last under heavy restaurant use. Our commercial bar stools are manufactured in the USA by union upholsterers. American made discount bar stools are typically made of higher grade components than their imported counter parts. If you are looking to add some additional economic seating, you can’t go wrong with bar stools sold at Bar Stools and Chairs. Our metal bar stool seats are reinforced with 2×4 supports to make them last longer in the fields. Our bar stool frames range from 19 gauge to 14 gauge steel. 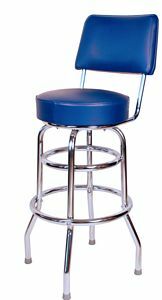 All of our bar stools are commercial quality bar stools and will last you for years at the point of service. One of the most popular types of metal bar stools are swivel bar stools. Swivel help lessen the wear and tear on upholstery vinyl. When people are sitting in a bar stool, they usually like to move around on their seat. Having a swivel bar stool allows the patron to move around in his seat without adding any stress to the upholstery. If given the option, I think most people prefer a swivel bar stool. Almost all of the bar stools sold at BarStoolsandChairs.com are swivel bar stools. Most of the swivel bar stools are manufactured by Richardson Seating. If you are looking for metal swivel bar stools, look no futher than the swivel bar stools sold at Bar Stools and Chairs. 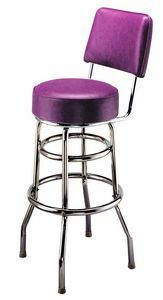 Metal bar stools are great bar stools for most commercial uses. The bar stools that we like to discuss are commercial bar stools manufactured for restaurants, bars, and hotels. The best types of metal bar stools are swivel metal bar stools. Swivel bar stools are great because swivels lessen wear and tear on upholstery. We also write a few other blogs. This metal bar stools blog is one of our newest. You can also find out more information about bar stools at Counter Stools, Logo Bar Stools, and Diner Chairs. Although it is sometimes hard to keep coming up with content related to metal bar stools, I will do my best. I want this blog to contain lots of great pictures of the bar stools carried at BarStoolsandChairs.com. You can find the best selection of commercial metal bar stools at that site. One of the staples at a local watering hole is the assortment of old metal bar stools. Most shot and beer joints have metal bar stools that range in age from a few months to tens of years. Owners do their best to fix the seats and frames and then break down and buy a new metal bar stool when all else fails. Most metal bar stools are made of steel or aluminum. Aluminum is great for outdoor use because aluminum furniture doesn’t rust. For indoor bar stools, steel bar stools usually make the most sense. Steel frames are usually powdercoated or chrome plated. Chrome lasts longer than powdercoats for most commercial uses. If you are looking for quality metal bar stools to be used as restaurant bar stools or to be used simply in your home, you can’t go wrong with the bar stools sold on Bar Stools and Chairs’ website. Metal bar stools are one of the best types of bar stools to use for restaurant bar stools. 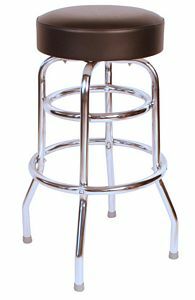 Metal bar stools are strong, durable, and able to last under the abuse of a restaurant, cafe, or diner. When looking for a metal bar stool, one thing to consider is the type of metal and the gauge of the metal. Steel is a great all around metal for metal bar stools. Steel framed bar stools need to have the steel finished in some way. The two most popular ways to finish the steel in a bar stool frame is to either chrome plate the steel or powder coat the steel. Powder coating allows the frame to come in any color under the sun. Chrome plating adds a durable metal finish comprised of Nickel and ingredients. If you are looking to keep your bar stools outdoors, you might want to shy away from steel metal bar stools. If you are going to put the bar stools outdoors, you should consider aluminum bar stools or plastic bar stools. 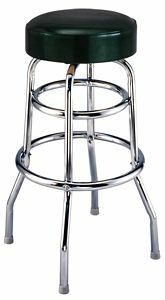 Steel bar stools and even chrome plated steel bar stools can rust when exposed to the elements. If you are interested in customizing your metal bar stools, you can add a logo and turn them into a logo bar stool. Logo bar stools can also be used as counter stools. Hi! Welcome to Metal Bar Stools!